What Brogo Dam lacks in size it more than makes up for with stunning mountain scenery. Situated in the foothills of the Great Dividing Range above Bega on the South Coast, the dam supplies water to irrigate pastures for the Bega Valley’s dairy industry and supplies towns and farmers along the Brogo and Bega rivers. The dam is also a popular fishing and water sport destination. Walk across the dam wall for spectacular views across the lake fringed by the rugged bushland of Wadbilliga National Park and downstream along the Brogo River. The dam wall is 260 metres long and 43 metres high. Open during daylight hours. Entry is free. Brogo Dam is about 30 kilometres north-west of Bega on the NSW South Coast. Bega is about 430 kilometres south of Sydney via the Princes Highway. The lake is a popular spot for water sports including power boats, sailing, canoeing and swimming. There is an 8kph speed limit for power boats. Canoes are available for hire. A boat ramp is located just south of the dam wall with picnic tables and toilets nearby. Please note: there is no skiing permitted on the dam. The dam is stocked with trout and bass. Fishing is best done on the water by canoe or boat, as the rugged foreshores are generally inaccessible. Access is via a boat ramp just south of the dam wall. From Brogo Dam bushwalkers and campers can explore Wadbilliga National Park. Brogo Dam is situated on the Brogo River upstream of Bega on the NSW South Coast and about 430 kilometres south of Sydney. 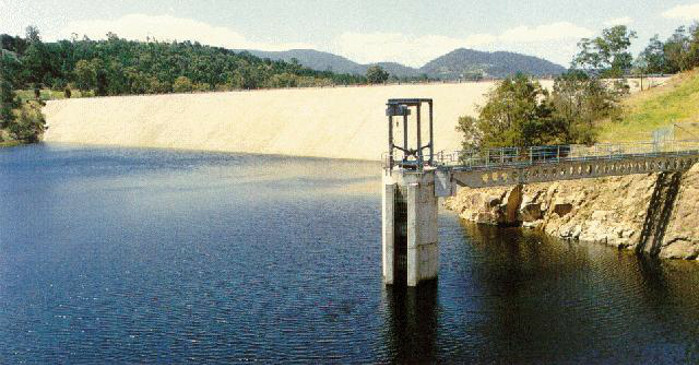 The dam was completed in 1976 to provide water for irrigation, stock and domestic requirements on the NSW South Coast. Brogo Dam was built to provide a reliable supply of water for the dairy industry, the main agricultural industry on the NSW South Coast. It provides water for improved pastures for stock feed as well as vegetables. Water released from Brogo Dam is taken from the river downstream for the townships of Quiaama, Cobargo and Bermagui. The dam’s 400 square kilometre catchment falls largely within Wadbilliga National Park with its rugged mountain terrain of steep ridges and deep gullies. Brogo Dam is a concrete-faced rock-fill embankment. The wall is 260 metres long and 43 metres high. An unlined rock cutting spillway is located just north of the dam wall. Construction began in 1964 and finished in 1976. Trigger - Storage level has reached Design Flood Level (top of intake tower). Trigger - Storage level has reached roadway crest level. Trigger - Spillway flows (uncontrolled*) over 1,500 megalitres per day. Trigger - Spillway flows of over 85,900 megalitres per day. Notification - Flows of over 85,900 megalitres per day are being passed. Range - 0 to 1000 mega litres per day. Trigger - When flow increases above or below 1000 megalitres per day.